The ups and downs of energy companies continued at Patterson-UTI Energy, Inc.
What: Shares of Patterson-UTI Energy, (NASDAQ:PTEN) jump 12.1% in April only to given back all of the gains in the first three days of trading in May. Here's what's going on. So what: The climb throughout March was helped by rising oil prices and a drilling report for March that showed 64 drilling rigs operational in the U.S. and an average of 71 for the first quarter. It's understandable that investors may have seen bright days ahead. But since the beginning of May the company gave its drilling report for April that said rigs had dropped to 56 for the month. A downturn in Canada and slower spring led to the weak figure, but that could mean a drop in revenue in the second quarter. Now what: Since Patterson-UTI lost $70.5 million in the first quarter with an average of 71 rigs in operation the loss could be even bigger in Q2 if the current results continue. 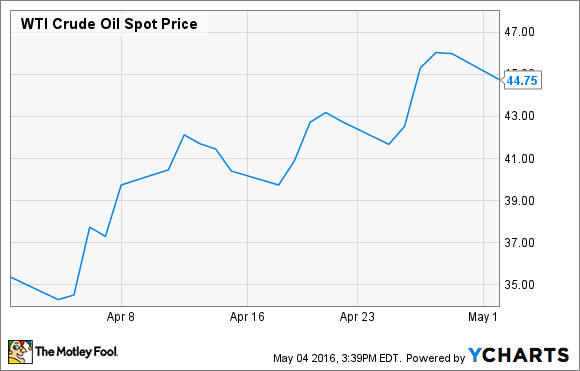 And oil prices have appeared to peak, at least for now, and slit slightly so far in May. There's a long road ahead for energy companies expecting an uptick in demand. Unless oil prices rise significantly I don't see a bright future and that increase in prices could be years away the way things are going.